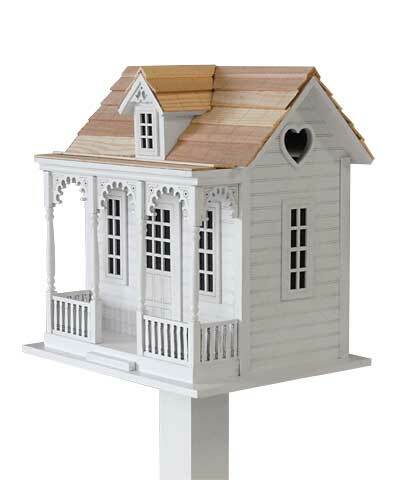 Turn your backyard into an architectural showcase by placing this Home Bazaar White Orchard Cottage Bird House in it. This highly detailed piece evokes Victorian era homes, while offering your feathered friends a generous roost. The rectangular shape of the home brings a classic look to the unit, enhanced by horizontal lines throughout it mimicking wood paneling. An extended porch has steps leading to it, and the roof is supported by columns. Gingerbread arches between each column add graceful curves to this piece, while faux windows and doors lend realism. A dormer window on the roof brings height to the home, and two bird cut outs with a heart between them perfectly celebrate birds. A heart shaped opening on one side of the item enables wrens, nuthatches, or chickadees to enter it, and the unpainted interior provides plenty of roosting room. A ventilation gap on the back of the shelter, as well as holes beneath the porch, prevent nestlings from overheating, and screening beneath the entry allows birds to reach it. Part of the back wall removes for nest checks and cleaning, and holes on the flat base of the shelter drain any captured water. An included bracket (not shown) affixes to the base of the abode for placement against a post or wall, and its curved accents match the home perfectly. This White Orchard Cottage Bird House easily creates a lovely nesting spot in your garden for you and your feathered friends to enjoy.